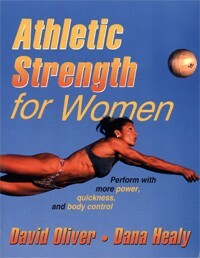 Athletic Strength For Women is a resource on strength training programs and specific exercises and drills for the female athlete. It does not address cardiovascular conditioning. • Recommended for: Female athletes from the high school level all the way to the Olympic and professional levels; trainers and coaches. • David Oliver has worked as a coach and athletic trainer at the high school, collegiate, Olympic, and professional levels for over 15 years. He was the conditioning coach for the US women's national soccer team and a strength and conditioning consultant to the US women's national basketball team. Oliver also spent 7 years with the NBA's Orlando Magic basketball team as the strength and conditioning coach and assistant athletic trainer. He holds certifications from ACSM, NATA, NSCA, and the US Weightlifting Federation. Currently, he is the founder and president of Oliver Sports Performance in Orlando, Florida. • Dana Healy is the head of strength and conditioning at the USOC. Before joining the USOC, Healy worked as the assistant strength coach at Brown University. She holds certifications from ACSM, NSCA, and the US Weightlifting Federation. First, it is important to point out that this text is a guide to strength training. It does not address any aspect of cardiovascular training. Thus, the title is appropriate for what the book offers. So, when using the many comprehensive tables to design training programs for specific sports, don't expect to see any drills for cardiovascular conditioning. • What I Liked About This Book: The book is well-organized and easy to read and provides a ton of useful information. It is packed with black and white photos of female athletes performing specific exercises, along with some shots of women during competition. (I counted 187 pics, to be exact.) There are also numerous tables that summarize the specific exercises for each sport. Chapter 2 ("Assessing Your Potential"), does a nice job of walking the reader through a variety of fitness and performance assessments and provides many useful forms that could be photocopied for use by the coach or trainer. The coverage of plyometric drills is excellent. • What Could Be Better: Despite all the photos, for some exercises, it's a little difficult to determine the proper technique. In some cases, a series of 4 or 5 shots, from beginning to end, would make it clearer, as opposed to only showing 2 shots (example: "Cycle Hops" on p. 142). Also, while the information on stretching is very good, the techniques on p. 159 ("Side Leg Swing") and p. 161 ("Trunk Twist") resemble ballistic stretching, which can be harmful if done aggressively. My only other criticism is that training regimens for several important sports (eg., cycling, tennis) were omitted, while others (such as golf) were included. Certainly, golfers might benefit from some strength training, but should coverage of that sport supercede some of these other more vigorous events? Also, for track and field, programs were provided for sprinters and throwers, but not for jumpers (high jump, long jump, pole vault). In summary, Athletic Strength For Women is an excellent book, though readers need to keep in mind that it addresses only strength-training. For athletes and trainers looking for resources for both strength and cardiovascular conditioning programs, an additional reference will be necessary. Athletic Strength For Women is mainly intended for serious athletes who participate in organized competition. Women who want a book on training with a more generalized approach should consider Strength Training For Women by Lori Incledon.